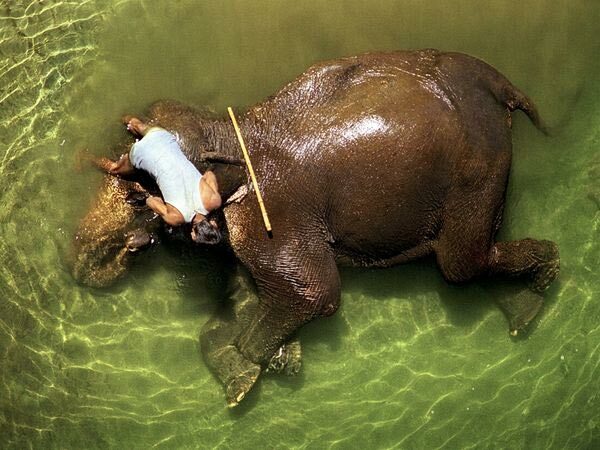 Amazing shot of elephant bathing by her mahout captured by Mohit Midha from India. He explains about his shot, “Watching a mahout lovingly bathe his elephant, I tried capturing the moment from the riverside but wasn’t satisfied with what I saw through the viewfinder. There was something lacking that made the image not do justice to the scene. I then climbed a tree with a branch extending out over the water and got my shot, which may have been my last as I almost fell off after taking it. I’m sure the beautiful elephant would not have been very happy about me falling out of a tree straight onto her stomach!